People with Marfan syndrome who are diagnosed early and receive proper medical treatment can now live a lifespan equal to people in the general population. This is great news, right? Well, for many people, this just brings up more questions. Living longer is great, but aging comes with all sorts of medical issues, even for those who do not have Marfan syndrome or a related disorder. Here are some of the most common questions we hear from our more mature members of the Marfan syndrome and related disorders community. 1. Will I have increasing bone and joint pain as I age? It is true that Marfan syndrome and many of the related disorders are progressive; that is, symptoms get worse over time. This does vary from person to person, though, and how much worse symptoms, such as pain, get – and how quickly they worsen – is unpredictable. Even people without a connective tissue disorder have bone and joint pain as they age. We recommend that you speak with your orthopedist (bone doctor) to discuss pain relief. A pain specialist who is familiar with Marfan syndrome can also be helpful. 2. If I haven’t developed heart or aortic problems by middle age, is it safe to say that they won’t develop in the future? Unfortunately, there are no guarantees because Marfan syndrome and related disorders are so unpredictable. The aorta – the large artery that takes blood away from the heart – can enlarge even in older adults with Marfan syndrome. Therefore, life-long monitoring is necessary to safeguard against problems affecting the heart and aorta. 3. I haven’t had problems with my eyes and I am now past the age of 50. I have heard that the lenses in the eyes usually dislocate in childhood. Does that mean I do not to worry about having this problem? Even though it’s most common for lens dislocation to happen in younger people with Marfan syndrome, it can happen at any age. And, when it does happen in older people with Marfan syndrome (age 70 or over), the dislocation happens very quickly and it is likely to happen in both eyes. 4. As I age, I’m finding it harder to work because of my medical problems. Am I eligible for social security disability based on my Marfan diagnosis? Eligibility for social security disability benefits is not based on a diagnosis like Marfan syndrome. However, the physical features of Marfan syndrome frequently interfere with the ability to work, but it is up to you to demonstrate your challenges and how they impact you. It is often a difficult process, but we can help by providing information about Marfan syndrome and related disorders that supports your application. Many people with Marfan syndrome are successful in obtaining these benefits. 5. Now that I’m getting older, I’m even more concerned that I won’t live to enjoy being a grandparent. Has the life expectancy for people with Marfan syndrome improved? People who are properly diagnosed, adapt their lifestyle, and receive appropriate medical and surgical management can live a normal life span (into the 70s). However, there are no guarantees, and having Marfan syndrome does not mean you might not acquire other conditions that are common in the aging population. On the bright side, our help center frequently speaks with people in our community who are over the age of 60, 70, and even 80 years old! 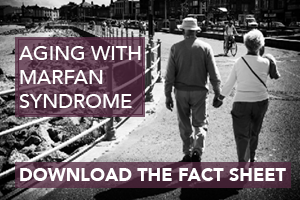 What are you concerned about as you age with Marfan syndrome or a related disorder? Please share your concerns here. In addition, you can participate in our 50+ phone support group. Email connect@marfan.org if you are interested.